Have you ever wondered what it would be like to be wrapped up like a package? No? Me neither however the K-Taping Pro course I took on the weekend was exactly like wrapping up a package, only we were wrapping each other. Taking turns applying K-Tape to a body part, limb, muscle, or ligament, we all ended up looking like Neapolitan ice cream. This was the first time this course had been offered here in the West and only the second time in Canada, and the turnout was impressive. The full weekend course was held at Treloar Physiotherapy Clinic on Broadway, and many of the big names in physio we there, including Deb Treloar and Judy Russell. Myself and another RMT from Victoria stood up for the massage profession and only one chiropractor, my partner for the weekend, Kavan Yu, also from Victoria brought his expertise. Kavan seemed to be a very gifted chiro and I would highly recommend him if you ever find yourself in Victoria. 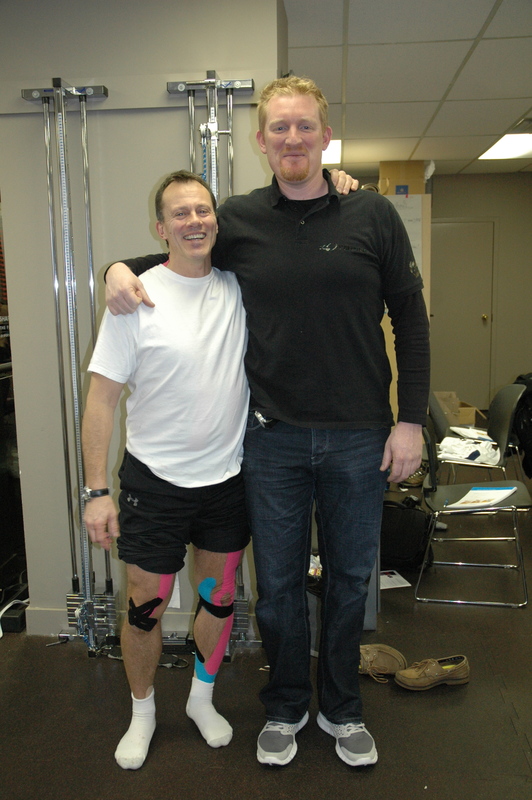 The instructor for the K-Taping course flew in from Germany, Christian Buttner , and from the onset this tall big man with a quiet demeanor knew his stuff. The K-Taping method is a holistic, non-medicinal treatment tool, developed in Germany by physiotherapist Birgit Kumbrink. 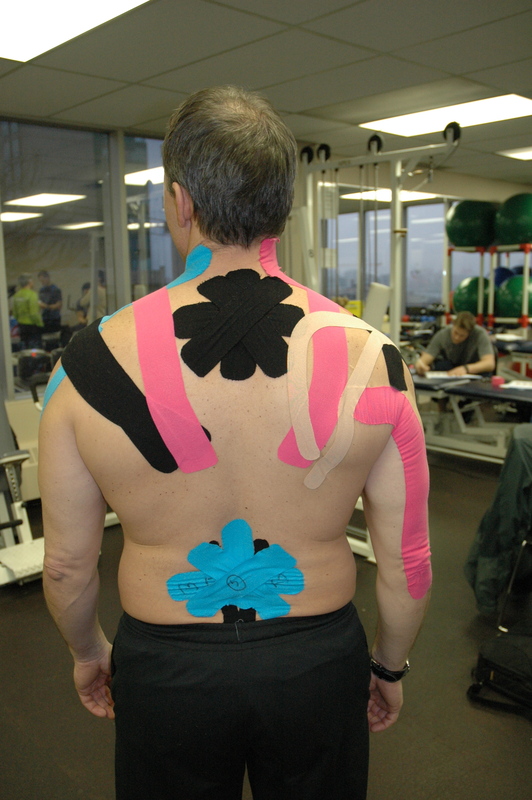 K-Taping supports almost all of the specialized therapeutic techniques, while maintaining the patient’s full mobility. This unique approach is increasingly being used worldwide and is now available in Canada through the K-Taping Academy Canada and of coarse, us, trained therapists. K-Taping supports almost the entire spectrum of physical therapy treatments, offering doctors and therapists a multitude of new treatment possibilities. Back problems, muscle tension, joint instabilities or disc problems can be treated, as can migraine, tinnitus, and menstrual pain. K-Taping even offers an effective post-operative concept in lymphatic therapy, for instance following breast cancer operations. K-Taping is established in competitive and professional sport for treatment, prevention and pre-training preparation. The following principle applies in all cases: K-Taping maintains the patient’s full mobility – a decisive advantage compared with previous treatment methods. To successfully implement the K-Taping therapy, professional training and specially developed elastic tape are needed: The K-tape’s water-resistant and breathable properties enable long wearing and comfort while its elasticity is comparable to that of human muscles. The K-tape is applied via a wave-like acrylic coating activated by body heat and which also takes over important mechanical functions. The K-tape does not contain any pharmaceutically active or adhesive ingredients and is therefore neutral to the skin. It maintains its full effectiveness under the varied stresses of work, sport, showering, swimming and other activities of daily living. The K-Taping therapy is based on two main effects. The first effect is the stimulation of skin receptors. This is associated with a reduction in pain and aids proprioception. It specifically influences the complex interaction between muscle tension, joints, ligaments and nerves. The second effect occurs when the elastic K-Tape and the special application technique raise the skin and the tissues. This creates more space in the damaged tissues. Lymph fluid can flow easier, blood circulation improves and the pain receptors are relieved. The improvement in blood circulation alone stimulates the healing process. The K-Taping therapy’s exceptionally wide spectrum of use comes into being when the effects on lymph flow and the receptor stimulation are added. K-Taping is only applied by specially trained and certified therapists and doctors. Medical knowledge in anatomy, muscle formation, the position of ligaments and nerve paths are necessary in order to learn how to use K-Taping and to apply all the possibilities that this complex treatment method has to offer. While the treatment effect from most manual therapy treatment ends when the treatment time is up, patients take the K-Taping therapy home with them. K-Taping works 24 hours a day, as a result of the application of the tape and the body’s movements. It maintains its effectiveness for the entire duration of wear, even under extreme stress from daily working or sporting activities. It is in this way that the lymphatic correction techniques permanently support manual lymphatic drainage between treatment sessions. K-Taping can improve the quality of life in many areas and prolong the treatment effect when integrated with modern therapy concepts, for example following Neuromuscular Therapy, and supporting the effects of Laser Therapy. Don’t be surprised if you come in for your massage and leave like a scoop of ice cream, with some blue, pink and black K-Tape keeping the therapeutic value continuing for days and days following your treatment. If you have any questions, please do not hesitate to contact me, or find a qualified K-Taping therapist through K-Taping Academy Canada.